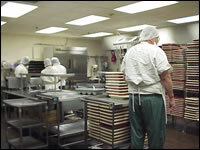 Food service is among one of the most important components of an effective jail operation; lack of satisfaction with food service is a frequent cause of inmate disorder. 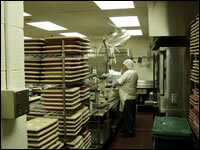 Food service operates seven days per week 5:30 a.m. to 9:00 pm. The Scott County Jail has a strong commitment to high quality food. Like other restaurants and food establishments in the county, the Scott County Jail is inspected by the Health Department twice a year. Menus are grouped into a set of four Fall & Winter menus and a set of four Spring & Summer menus. Menus are reviewed every six months. The Fall and Winter menus start on the first Sunday in October while the Spring and Summer menus start on the first Sunday in April. The menus repeat over a four week cycle. Requests for special diets are sent to Support Services for review. All legitimate requests are honored. Support Services notifies the Food Service Department. Occasionally, the department receives requests for vegetarian diets. Nutritionally equivalent substitution for items on the menu that cannot be served due to religious beliefs are provided. Medical diets are ordered by the Medical Staff. The most common diets are diabetic, lactose intolerance(milk and dairy products), food allergies, and mechanically altered (soft, easy to chew for persons with dental problems). All menu plans meet or exceed the minimum dietary allowances of the National Academy of Sciences. All menu plans are approved by a registered dietitian. The Food Guide Pyramid is used as a model for the menus.